Connected citizens trained in CPR now have a new tool to help them save lives. Update below from Tim O’Reilly, who attended the announcement. 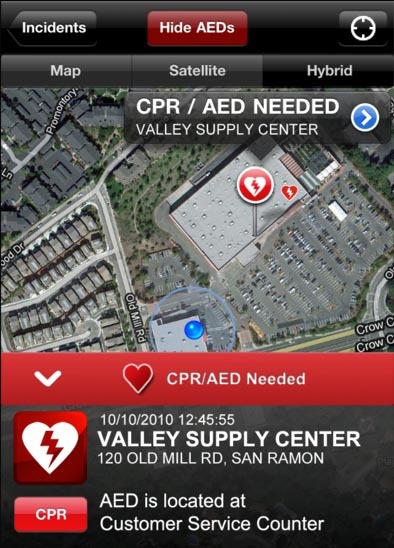 Today the San Ramon Valley Fire Protection District (SRVFPD) in California is launching an iPhone app that will dispatch trained citizens to help others in cardiac emergencies. The new app, available at firedepartment.mobi, is the latest evolution of the role of citizens as sensors, where resources and information are connected to those who need it most in the moment. The FireDepartment app is also an important example of Gov 2.0, where a forward-looking organization created a platform for citizens to help each another in crises and planned to make the underlying code available for civic developers to improve on. Given context and information, trained citizens in San Ramon will now be able to do more than alert authorities and share information: they can act to save lives. This FireDepartment application will empower citizens to bridge that critical gap of time before paramedics arrive and give them access to an essential tool: an automatic electronic defibrillator (AED). When an AED is used within the first 10 minutes, survival rates rise to nearly 80 percent, said Price. This new app could help to improve that survival rate by alerting a trained citizen to a crisis nearby and showing them where to go to get an AED. According to Price, AEDs are currently taken off the wall in 5 percent of cases. The app also includes access to the radio band where first responders coordinate response. The mechanism behind the application relies on both human judgment and automated software. After a trained 911 dispatcher inputs certain codes from a call, the software automatically sends a push notification to all of the people with the app in the jurisdiction. Citizens that have downloaded the app get a text alert pushed to them when there’s a nearby incident that fits the cardiac arrest profile. The fire departments don’t know who a given citizen is, said Price, only that they’ve opted in repeatedly and indicated that they are CPR-certified. “We use the long Apple ID and only track in our jurisdiction. We start tracking any phone that’s running the app that’s in our district.” Eventually, this may develop into a multi-jurisdictional client where citizens could use a configuration screen to toggle locations on and off. Opening the smartphone then brings the user to a map with the location of the incident, the nearest automatic electronic defibrillator (AED) and the citizen’s current position. In a follow-up email, Dermetzis said that WorkDay developers have volunteered to get the app running on more platforms, including Android and BlackBerry. 1. It’s a real “scratch your own itch” app. It was developed after the San Ramon fire chief had the horrendous experience of sitting at lunch with his team (including a paramedic) only to discover that next door someone had been dying of a heart attack. He didn’t learn of it till the fire truck pulled up, siren blaring. He realized the need for an alert system that would reach out to the mobile phone of anyone trained in CPR who is nearby. Hence this app. Now, when an ambulance or fire truck is dispatched to help a heart attack victim, the same dispatch is sent to the app, which checks to see if the user is nearby to the person in crisis. In addition, the app shows the location of the nearest AED (defibrillator). 3. There’s a real challenge, though. 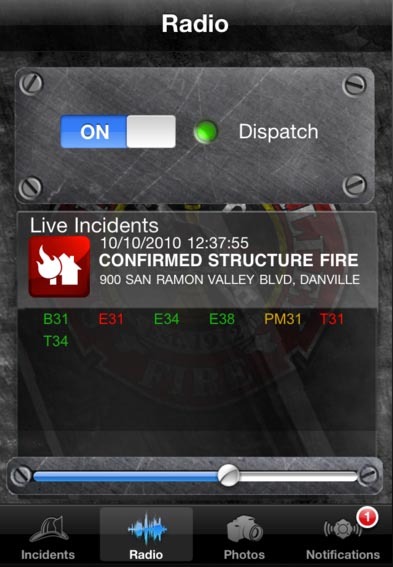 While San Ramon has built a tool that works well for their purposes, and has evangelized it well to their local citizens (22,000 people already carry a previous version of the app, which lets citizens report or follow other kinds of emergencies), it needs to spread to other fire districts around the country to achieve its true goal. This made me think it might be a good fit for Civic Commons, which aims to be a mechanism by which cities can share their innovative projects with each other. The app itself doesn’t really need to be open sourced (though San Ramon is considering that.) Local resident Dave Duffield (of Peoplesoft fame) has committed developers from his new company, Workday, to develop Android and Blackberry versions. What does need to be open sourced is the back-end code that interfaces with the Computer Aided Dispatch (CAD) systems used by police and fire departments to respond to 911 requests. The San Ramon app interfaces with an Intergraph CAD system, but there are six other major vendors whose systems are in wide use. San Ramon and Workday are working to think through how best to package up the interface code so it can be ported to other systems. San Ramon is looking for other agencies that want to adopt the app.